After initial emergency care, the patient is admitted to the acute SCI Center in the Neurosensory Intensive Care Unit (NICU) or the Intermediate Neurosensory Intensive Care Unit (INICU). 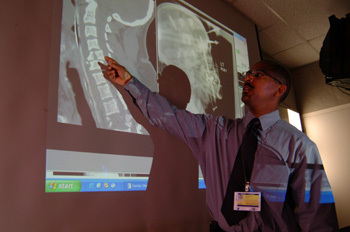 At Jefferson, the team of specialists stabilizes the patient's spine and manages any additional medical problems. The team meets weekly to discuss the patient's progress, problems, goals and treatment plans. Physical and occupational therapists, social workers/case managers and psychologists begin seeing the patient in Jefferson's NICU/INICU to prepare for future physical rehabilitation. In addition, speech pathologists work with patients who require a tracheotomy and their families to facilitate communication. While patients are in the acute SCI unit, other rehabilitation goals include: initiating programs for bowel and bladder management; maintaining skin integrity; maintaining and increasing the range of motion in each joint; maintaining good pulmonary function; and strengthening muscles in preparation for intensive rehabilitation. Patient/family education provides information about spinal cord injury, the problems and concerns associated with it, and the resources available to SCI patients and their families. Rehabilitation professionals also provide counseling and support to help patients and families deal with the changes.